A well-maintained commercial property can significantly affect the success of your business, attracting new customers and increasing your annual revenue. What’s one of the best things you can do for your business property? Commercial brine treatments. What Is a Commercial Brine Treatment? Do you have a major event coming up? Something that may generate a lot of foot traffic (and revenue you don’t want to miss out on)? Call Alternative Environments to schedule a brine treatment before your event. We’ll come out 12-24 hours before your big event to apply a salt spray pre-treatment. This treatment will protect your sidewalks and parking lot, preventing the formation of black ice in the event of a storm. That way you can focus on your customers, not on what the weatherman says. Why Work with Alternative Environments? We have a reputation for quality, experience, and professionalism. 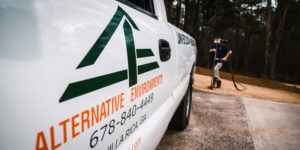 Our staff is diligent, experienced, and committed to continuing education so we can provide your commercial property with the best landscaping services. We focus on aesthetic maintenance, safety, and potential improvements to your property. We have add on services available, so you can tailor your commercial property maintenance to the needs of your business. And we’re always willing to work with your schedule. After all, the basis of our business is making property maintenance easy for you. Looking for long term lawn care? We’ll develop a contract that suits the needs of your business. Stop worrying about landscaping scaring off customers. With our help, your property will look attractive and inviting year round. Contact Alternative Environments to learn more about commercial brine treatments.